I scaled down writing political commentaries because I believe that one can only criticize people who have the hearts and minds to change; people who look at criticisms and analyze their performances to improve institutional functions. Unfortunately, there’s only one thing the SPLM has done very well: the destruction of the country. What the Portuguese did in Mozambique in the 1970s when they left, is like what South Sudanese leaders are doing to the country. These men and women are looting, destroying and ruling as if they will leave tomorrow for ‘their real’ country. The saddest thing about South Sudan now is that it has become a private property of gluttonous, incompetent and soulless men, who don’t care about the average South Sudanese. Our civil population dies or flees, goes hungry, but these men and women care less as long as they have their bloody dollars to spend on their mansions, villas and gargantuan SUVs in foreign countries. Recently, we learned through a parliamentary committee report that the government of South Sudan doesn’t keep the oil money in the Central Bank. Do we have to wonder who’s to blame? But who’s surprised, really? The ministry of Finance and Economic Planning officials, the looting engine of the SPLM leadership, lost their moral and human souls when they saw and smelt the mighty dollar! Not only is this destructive to the average hard-working South Sudanese, who needs hard currency, it also shows the callous extent to which Juba leaders would go to make sure that South Sudan is burnt to the ground. And there’s no end in sight as these callous, clueless and kleptomaniacs continue to burn what’s left of South Sudan to ashes. And the man, who’s supposed to be the guiding soul of the country, makes light of the fact that over 2 million South Sudanese are living outside the country as another 2 million languish in disease, hunger, insecurity, and death. The SPLM-IG is a bunch of sheep led by a man who knows not his right hand from his left hand as he’s fed delicious food by selfish, gluttonous and blind supporters, who’d go to any extent to keep this man happy and clueless. SPLM-IO is another bunch of hopeless, structureless, leaderless bunch, who have no strategy to win anything except the fact that they oppose a rotten regime. They sing ‘winning and viva’ as if victories will descend to them from heaven in a divine fanfare. Their directionless rebellion, like the mess in Juba, is prolonging the suffering of the citizens. Other opposition groups outside these two ruinous SPLM halves are a bunch of self-righteous men who only want to oppose without any tangible alternatives in terms of policy. How did men and women who spent the prime of their lives fighting for the liberation of the country become such monsters? How did the then jewel of the liberation become the drinkers of the blood of the southern woman, man, and child? How did the African wisdom shun such men as they grow older? SPLM is basically without a shred of caring leadership. How can a nation that prided in producing strong-hearted men who stood up for the rights of the African Person in the Sudan since the 1940s, produce such fat, clueless and callous men who continue to kill the very people the likes of Lolik Lado, Chan de Bilkuei, Both Diu, among others, spoke up for or fought to liberate? No sane human being would say that he’s doing something positive when more than a third of the civil population has fled the country? South Sudanese citizens are being abused, insulted and mistreated now in Sudan as refugees. 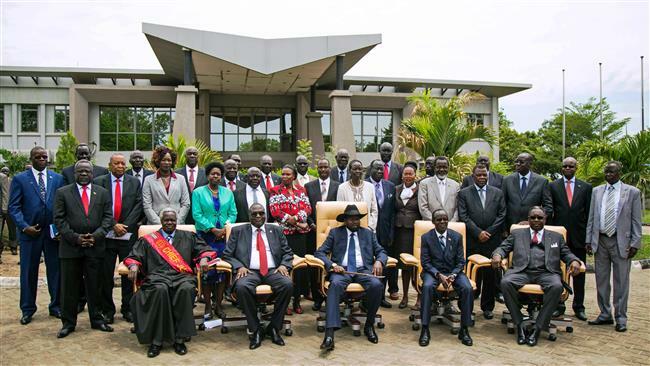 What’s different between a foreigner ruling South Sudan and the government of Kiir Mayardit? South Sudan has been destroyed in a manner we’ve never seen before. As our people suffer, there are still blind and greedy supporters, who still believe that ‘President Kiir is doing his best.’ How did we become such immoral as to see death of our own as normal? How did we become people who put pride in leaders before human lives? SPLM should know that peace is not easy, but it's valuable for national development. Nations don't develop when they are at war. The only way President Kiir can get rid of the specter of the lost souls that'd HAUNT him to his grave is to bring peace. John Garang made peace with the Nasir Doctors [Lam Akol and Riek Machar] not because he liked or trusted them, but because such an initiative was necessary for the unity of the South. No matter how incompetent a leader is, the suffering of the people should be something he or she should always pay attention to with humane eyes!